These brochettes are very special because the shrimps’ flavor when they are fried is quite good and if we add to this that they come marinated in achiote salsa , the flavor becomes sensational. – The achiote salsa gives to the food a flavor that is strong, peppery, spicy. slightly smoky and with nutty notes. All this combination generates very interesting effects when it is united with the delicate and sweetish flavor of the shrimps. But that’s not all because the color that the shrimps acquire is spectacular since they turn into an intense red color. A color that really whets the appetite. The achiote’s color is so beautiful that even the Mayans used it to paint. This dish is flexible because it can be served as appetizer or as a main course and for garnish it can be added: white rice , pot beans or a salad. Oh and don’t forget that these shrimps are excellent for a barbecue with friends. Preparing this recipe is easy, only a salsa has to be prepared and then the shrimps are fried. Preferably buy large shrimps so it will be easier to make the brochettes. If you are going to prepare this recipe on the grill. Leave soaking the brochette skewers in water for 1 hour, before using them so they won’t burn. In this recipe the brochettes only have shrimps but more ingredients can be added like: onion, mushrooms, zucchinis, bell pepper, pineapple, etc. The preparation time is of 15 minutes and the marinade of 2 hours. Put in a food container the shrimps with the ones you worked and reserve. The juice of 1 Orange. Pour in the food container, where the shrimps are, the salsa that was blended. Mix very well the food container ingredients with a mixing spatula. Cover the food container, put it in the fridge and leave the shrimps marinating for 2 hours, so the flavors mix. Take from the fridge the shrimps and insert them in 4 brochette skewers, in such a way that they end up in the form of a “C". Then set aside. If you want to put more ingredients in between the shrimps this is the moment. 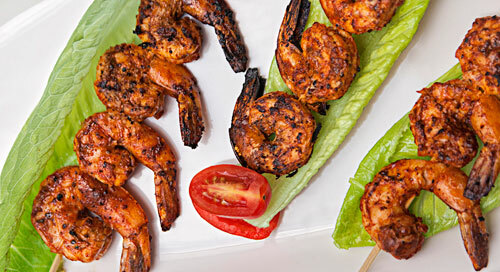 Incorporate in the frying pan the achiote shrimp brochettes that were made and fry them for about 4 minutes, until they are moderately fried; move them regularly with some tongs. Careful! Don’t fry the shrimps for a long time because their consistency becomes rubbery and they lose flavor. Recommendation: If you liked this recipe, you cannot miss trying the tacos al pastor because the meat is also marinated in a salsa that is very similar to this one. Variation: Taste the shrimps with another type of salsa – devil shrimps. Did you like the Shrimps? Use “El Yucateco Achiote Paste" in these shrimps because it has a tasty elaborated flavor and a perfect consistency. These shrimps are very fresh, its flavor is very good and they are ready to be cooked. Its size is large and they will look very nice in your brochettes. Use bamboo brochette skewers because they are resistant and food tends to taste better than with the metal brochette skewers.